Hearthstone on pasture as a 2 year old. Lot 11. Bar JZ Fireside 311E, son of Hearthstone. 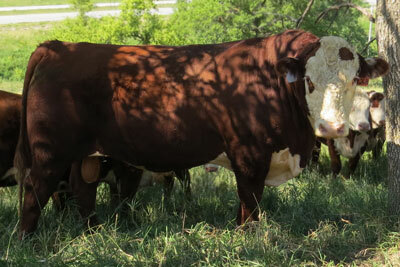 His dam 347Y comes from a long line of maternal excellence. and her dam had an average WR of 107 on 9 calves. Lot 46. Bar JZ Homeward 313E, a Hearthstone son. Lot 34. Bar JZ Grindstone, a Hearthstone son.